Copycat is here! (in full) and Copycat also has it's own MySpace with excerpts of several versions. Copycat Le Blog also has the lyrics and background info. The video of Copycat features Le Chat, a character popular cartoonist by Philippe Geluck. For the occasion Le Chat is Elvi-fied and becomes Copycat. A Special edition cdsingle is available with the may 6 issue of Le Soir (Belgian Magazine). This cd has the same tracks plus the videoclip of Copycat. This year it's RTBF's (Wallonian TV) turn to select a song for Eurovision. Ouchène is the lead singer of rockabilly combo Runnin' Wild. whose latest CD I Dressed In Black Today is out now on Drunkabilly records. Ouchène records in English and French. Writer of the song Copycat, Jacques Duvall wrote for Viktor Laszlo, Pierre Rapsat and (fab) Lio. 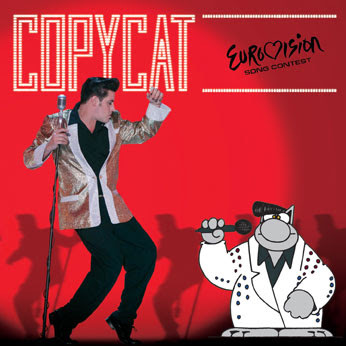 Copycat is the first Rock 'n' Roll song in Eurovision since 1956's So Geht Das Jede Nacht by Freddy Quinn. 50.000.000 Elvis fans can't be wrong? If you get the Elvis fans against you you know you're in trouble. Belgian (and worldwide) Elvis fans aren't too happy with Copycat, seeing the song as an insult to Elvis Presley. They're trying to get the EBU to ban the song from the contest. Times have changed, remember the 50's, when people were trying to ban Elvis because of his gyrating hips and all?. Well Elvis fans, you are them now, good luck. Special thanks to RTBF, Marina Waha.